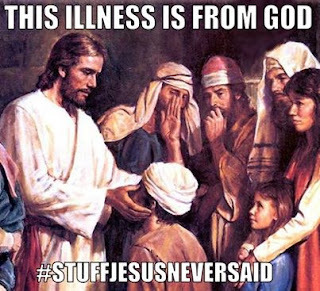 “How God anointed Jesus of Nazareth with the Holy Ghost and with power: who went about doing good, and healing all that were oppressed of the devil; for God was with him." Isn't this photo a hoot?! My friend, Charlene, in California sent it to me. Here's 2 intelligent men with binoculars and 1 that climbed on top of the truck to see any wildlife that might be passing by. The driver doesn't even seem to be paying attention to anything. 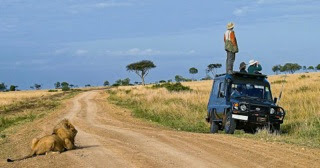 I would think he was the "safari guide" and has seen it all. And look who is also watching wildlife ... I wonder if the lion was still there when they turned around to get back in the truck? Sometimes I'm so intent on looking farther up and out in my back woods that I miss what's right in front of me staring at me like it's saying, "Hey Lady! I'm right here for you to photograph." Makes me think of how often we are looking "out there" for the Lord to respond to us when He is within us all the time. Somebody said, "That's why you bow your head when you pray .... so you can look at Him." The Lion of Judah, ever vigilant, has your back covered. Trust and Rest in Him! Gardening - You don't need a gigantic backyard to grow a thriving and bountiful garden. In fact, just a few containers on the ledge of a sunny kitchen window or on the balcony of a small apartment can be home to a garden of succulent fruit, aromatic herbs and hearty vegetables. Nutritional powerhouses such as baby kale, spinach, and wheatgrass not only grow easily in containers but also produce several cuttings once they're planted. These vegetables are a good choice for indoor gardening newbies. Imagine the luxury of walking only a few steps to your kitchen windowsill to trim a few kale leaves off for your morning power smoothie. The possibilities are endless – think creatively when it comes to planting in small dwellings. Is your great grandmother's heirloom china taking up too much cupboard space? Fill an old teacup with loose potting soil to plant small green succulents or aloe vera plants. Get some great ideas in this article. Nearly 40% of the contiguous U.S. is now in drought and gardeners are starting to feel the pinch whether by law or social media shaming. But a lush garden in drought conditions is achievable — and can be as simple as watering plants early, using mulch, and choosing the right species. More plants than you might think do pretty well in drought conditions including beans, melons, tomatoes and squash. Focus on these plants for your summer garden and avoid brassica vegetables like kale, collards, cabbage, broccoli, and cauliflower that tend to be gluttons for water. Save these vegetables for the cool seasons of fall and early spring when rain tends to be more plentiful. Read more. Critters - We've had a lot of deer around this year. We saw one doe (female) that had 2 fawns with her. 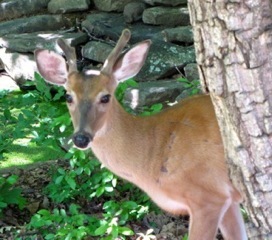 This young male deer has been spending quite a bit of time with us. There's an area in the front corner of our property that is rather perfect for places for deer to lie. He likes it there. You can see the flattened places where they lay, especially since we've had rainy weather pretty regularly for weeks now. So, I see this growing little guy around many times during the day. I love to see their fuzzy antlers. Makes me want to go over and rub them. Having the small frog pond that we do has been a real draw for wildlife. Water is more precious than anything to them and the birds. We have birdbaths, of course, but some of the species just like drinking from the pond. We have a young Red-sholdered Hawk born again in our habitat. That means more food sources are needed and since they remain in our habitat it's not good news for the frogs or the birds. Oh what a delight Heaven will be when the animals don't have to eat one another. 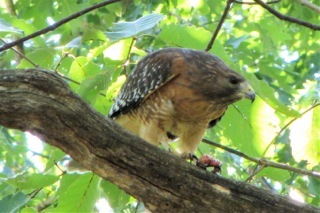 The Red-shouldered Hawk in the photo has one of our frogs from the pond in its talon. Once the young are out of the nest they wander nearby sitting on branches, strengthening those wings to be able to fly high in the sky, and calling out to the parents for food. I guess it's their way of staying in touch with their next meal. Shouting, "Here I am! I'm hungry with all this exercise." Oh my! After about 15 straight minutes of the squawking, I'm about to scream myself. It's the most irritating sound when it's repetitive. Listen to the first song option if you'd like to hear it. Tidbit - Pets - Summertime can get hot. People go for ice cream, but dogs enjoy something cold also. Frozen homemade dog treats are a refreshing break on those "Dog Days." The phrase itself refers to the sultry days of summer. You know what your dog likes, so here's a website that has a bunch of frozen recipes for dogs. Bugs - I know bugs aren't the most favored critter in most people's minds but they sure have become a fascination for me. Even as a child I thought Daddy Longlegs was a pretty cool bug simply because my Daddy enjoyed seeing them. This is one of many of the species known as Harvestmen (what Daddy Longlegs are actually called). They are not part of the spider family but related to it. 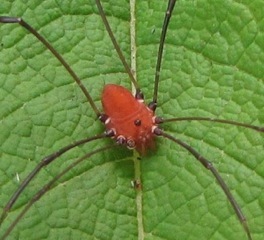 One student of harvestman life once wrote, "A study of harvestmen is a study of legs." That's because the legs, especially the second pair, serve as ears, nose, tongue, and perhaps even as supplementary "eyes." The legs are loaded with nerves and literally thousands of tiny sense organs that lie inside microscopic slits in the legs. Although for the rest of the bug realm, I was terrified of any bug as a child (following the example of my mom) and into adulthood. It wasn't until we moved to some wooded land when I was 39 that I began to appreciate the amazing design and colors of bugs. I remember seeing my first Praying Mantis and thinking how it almost looked human with that turning head and eyes and those long feet. Maybe a little bit like Edward Scissorhands if you saw the movie many years back. I realized that bugs were part of God's plan of benefits for us and I should have a different attitude toward them. Yes, I know not all bugs are to be loved. With the Fall came the evil side of all things and bugs have deviated from God's plan also. After the Fall in the Garden, as with everything else, sin entered into the world so the "darker side" of the bug kingdom also had changes. Disease-born and biting bugs became part of this world also. God didn't make mosquitoes any more than He makes a deformed child. He made everything He created with seeds that would continue to reproduce, but when those seeds get altered physiologically or scientifically things get a bit warped for sure. Anyway, with the macro lens feature of the camera, it sure is easy to get a photo of a bug closeup and then see the many intricate details after loading it onto the computer for viewing. What incredible designs our God has created in His Creation made for our enjoyment. And to think that there are times when we doubt He will take care of us. In Matthew 26:26-27 Jesus said, "Look at the birds of the air; they do not sow or reap or store away in barns, and yet your heavenly Father feeds them. Are you not much more valuable than they? Can any one of you by worrying add a single hour to your life?" All through the Bible meditation on the Word is encouraged with great benefits and blessings for doing so, and yet it's so easy for us to spend our meditation in worrying rather than on the Truth which brings hope and provision. We have to connect in faith to receive all that has been provided for us, but instead we spend our thoughts and waking moments of the night in rehearsing what the devil has done instead of declaring what God has provided for us. Trust and rest ... sounds so simple and yet the hard part is to enter into that rest. We are so used to judging life by what is being seen with our own eyes and heard by our own ears. There are only two other instances in Scripture that give us information about Martha besides being so busy: that she had a brother named Lazarus and a sister named Mary. When Jesus visited their home, Mary sat at his feet to listen to every Word. Martha complained about "much serving to be done" and asked the Lord to bid her to help, but Martha was corrected by Jesus. She had misplaced her priorities on this occasion. Later, at a supper for Jesus in the home of Simon the leper, Martha was once again serving while Mary her sister was worshiping Jesus by anointing His feet with a costly perfume. Martha was not wrong in serving Jesus and His disciples. Other women ministered to Jesus in this way without being corrected. Serving was a good thing, but Martha had put it in the wrong place. Her problem was priorities — not what she was doing. It was a great honor to have Jesus in her home and to be able to hear His personal words to her household. Martha should have given this the same priority that Mary did. Just like Martha, we get occupied with things that keep us from hearing the words of Jesus. It is easy to recognize and turn from things that are obviously sin, but even good things that we are involved in must be prioritized so that nothing takes the place of seeking first the kingdom of God. I have to admit that it's not just the "serving" that would've had me bouncing around the kitchen, but also the things that I didn't really have to do. You know ... the things that make it more special. The little details that we add to increase the time and labor and also the accolades from those who will feast from our fare. I overdo in many areas like that. Is it pride? When I had all the energy in the world, I kept a super clean house. With the heart issues I've been challenged with right now, my house is definitely not super clean. I loved housecleaning and cooking buffet dinners and getting all the praises, but I can tell you right now they're not worth a half a cent. My husband has taken the "housekeeper" role and kitchen duty and I can tell you that he's an incredibly wonderful man to have filled in all the areas that I used to bounce around and do, but he's not a supreme house cleaner. He wasn't created to be so. He's open and willing to learn, but I find myself hearing the Lord say, "Let it go." Why should I have him working to my standard of cleanliness or perfection? I'd rather he have more time at the feet of Jesus. There's also another comment the Lord brought back to me as I was typing this. When I had in-home groups for buffet dinners or Bible study back in Alabama, one girl said to me, "I could never have you over to my house with as super clean as yours is." I should've given more thought and importance on what God wanted me to hear out of that statement. I'm sure us perfectionist, overworking and over zealous folks have made quite a number of people feel very inferior. Where is the balance in being a good steward and getting into the realm of "overkill" which not only takes us away from what God might rather have us doing? Shenandoah National Park nearby and took a guided tour of Big Meadows from the Byrd Visitor Center which sits on a hill overlooking the Big Meadows area. We learned a lot that day and also saw how Spotted Knapweed was beginning to invade the meadow. It's on the USDA list as an invasive species. The park tours are always very informative. My neighbor, Kathy, and I did the tour of Herbert Hoover's place off Skyline Drive. Lots of history. 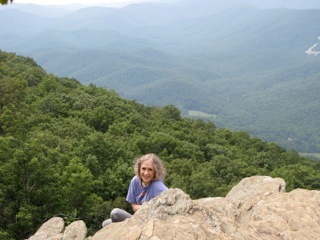 If you've not traveled to Shenandoah Park or Shenandoah Valley area, you may want to visit virtually. I have a few albums of places there and on the Blue Ridge Parkway which is a continuation of Skyline Drive that turns into the Blue Ridge Parkway on the south side of I-64. Big Meadows Walk and Byrd Visitor Center - Best stop along Skyline Drive with free tours. Greenstone Trail - A self-guiding loop trail with incredible views. 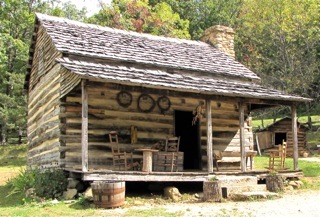 Humpback Rocks Pioneer Homestead - A 19th c. homestead farm. Get a feel for life as it was then. Ravens Roost - One of my favorite stops with amazing views and rocks. Swannanoa Palace - Italian Renaissance Revival villa built in 1912 by millionaire and philanthropist James H. Dooley. The Wildlife Center - A wildlife rehabilitation center with online webcams and online teaching. Closing Thoughts - I'll end with these lovely views and dreams of distant places our hearts are drawn to. Don't bury your dreams. Life goes by too quickly. Make them come true. You really can! God's Blessings Surround You Every Day!